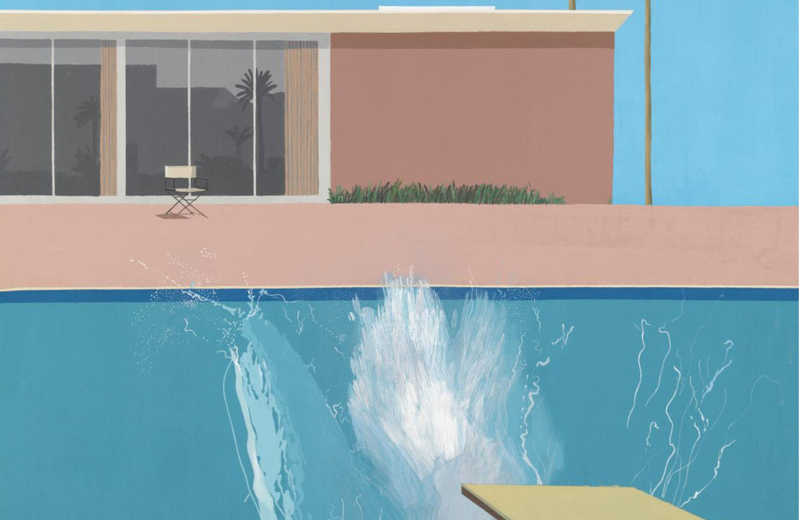 Originally attracted to Los Angeles after reading John Rechy’s libidinous novel, City of Night, British born artist, David Hockney is perhaps best known for painting scenes of L.A. swimming pool culture in the 60s. With two West Side residences and dual citizenship, his love affair with L.A. hasn’t faded over time, and neither has his reputation as one of the most influential pop artists of the 20th century. Basically, what Wayne Theibaud is to San Francisco, Hockney is to L.A. His paintings help define the minimal aesthetic of modern living in the Southland. And perhaps even its hidden malaise. The domestic suburban scenes – such as the ubiquitous Bigger Splash (pictured) and Sunbather – emphasize the brightly colored and patterned surfaces, and yet there is something eerily still about them, as if a darkness may be lurking beneath the good life he depicts. His collage photography, also very influential, captures multiple perspectives simultaneously – almost like a 3D cubist painting. Both his photography and paintings are currently on display at L.A. Louvre gallery in Venice. If you needed another excuse to head to the wonderful West Side, this is one. FREE until September 4, 45 N. Venice Blvd.